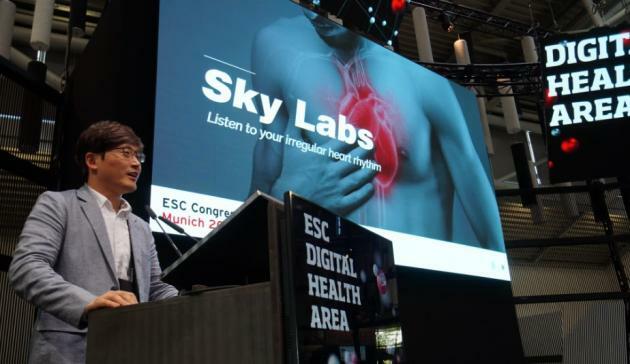 Sky Labs made a presentation on the effect of using a wearable device for chronic heart disease patients and related research, at the meeting of European Society of Cardiology in Munich, Germany, from Aug. 25-29. Sky Labs CEO Lee Byung-hwan speaks at the meeting of European Society of Cardiology held in Munich, Germany, from Aug. 25-29. The annual meeting of ESC is the world’s largest cardiovascular congress, bringing together 31,000 healthcare professionals from 150 countries. The participants reveal 4,500 abstracts in 400 cardiology topics. Sky Labs was the only Korean company that took part in this year’s conference. Sky Labs has developed a wearable device and a related service for medical care. The company’s ring-shaped atrial fibrillation detector CART (Cardio Tracker) monitors atrial fibrillation 24 hours a day using Internet-of-Things technologies. One in four people aged 40 or more suffer from the chronic disease. “We will seek sales license in the U.S. and Europe in October and expand our share in the global market,” said Lee Byung-hwan, CEO of Sky Labs. ESC Digital Health was the session where the largest number of companies participated. Eight firms took part in the session, including U.S. digital healthcare device provider iRhythm, whose market cap exceeds 2.3 trillion won ($2.05 billion), and U.S. startup, AliveCor. Sky Labs won the final prize at the Grants4Apps (G4A) competition, run by German pharmaceutical behemoth Bayer, to receive the multinational’s investment in 2017. In May, the company teamed up with Germany’s Charité, one of the largest university hospitals in Europe, to conduct a cardiovascular-related trial.